The bathroom vanity is a make or break element in the design of a bathroom. The style, scale, placement, size, and storage of the vanity in your bathroom are all key to the room's function and feel. In many cases, the vanity is a crucial visual focal point, and may even be the only thing really making your bathroom unique or interesting. 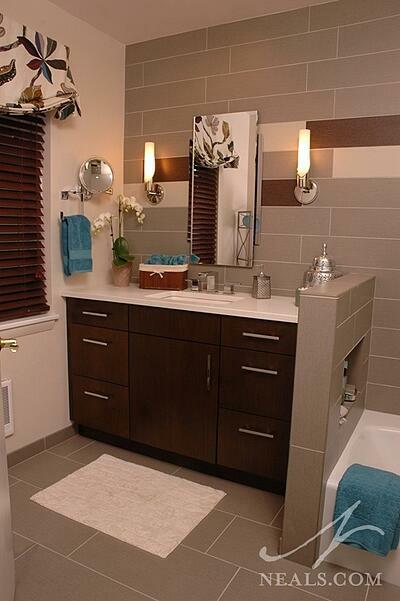 With so much resting on the vanity, it deserves a good amount of thought and planning in any bathroom remodel. This modern Japanese-inspired floating vanity is one of the elements that set the style for this room, but there's a lot of functional storage packed in this cabinetry. A standard vanity and mirror combination will be 68"-70" tall (measured from the floor). 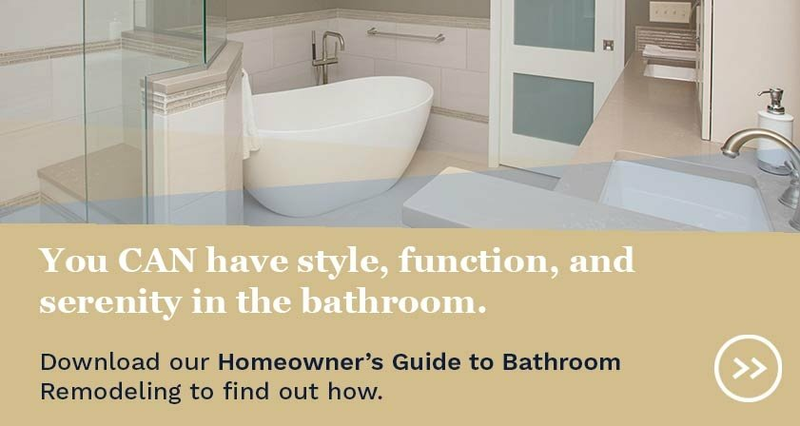 With this measurement as a guide (your final design may be different from this standard) start by taking a look at the architectural features of your bathroom. Windows, angled walls, high or low ceiling heights, niches, etc. can limit or dictate feasible locations for a vanity. Keep in mind that these elements don't necessarily rule out certain locations, but that custom solutions may be needed if those locations are used. Remember also that a functional vanity will also include lighting, towel rings or bars, waste basket, and electrical outlets, so space will need to be found for all of these in addition to the mirror and sink. 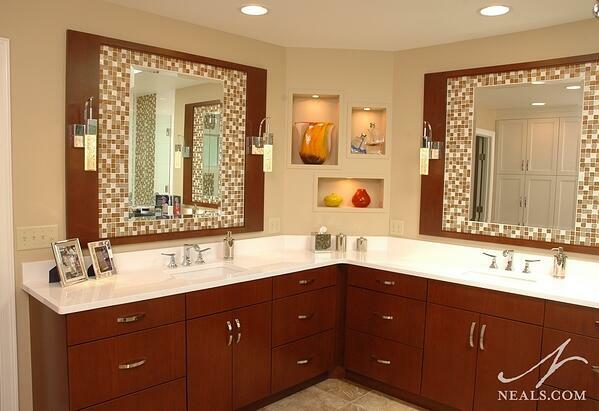 Make sure the vanity cabinetry doesn't infringe on the accessibility of the bathroom or other elements in the room. Adequate floor space and door swing clearance (for the bathroom door as well as shower and closet doors if present) are two major considerations. The vanity should also fully open to allow access to intended storage space, and should not impede your ability to clean any areas of the room. If you are interested in a universal design vanity, be sure to also evaluate the ability to access the storage and sink from a seated position, or from a wheel chair. In this contemporary bathroom remodel, the vanity makes use of the space at the end of the tub. Be aware that rerouting or restructuring any plumbing can become very costly. Even just switching from a traditional floor-mounted vanity to a European wall-mounted style still means rerouting pipes. Utilizing existing plumbing as much as possible is the best way to keep these costs down. Vanities come in a huge array of shapes and sizes, including pre-made units, semi-custom or custom cabinets, repurposed furniture pieces, and antiques. For any of these options, moisture in the form of water and humidity take their toll. Wood veneers, laminates and thermofoil surfaces tend to work best for the cabinetry component of the vanity. Other materials should be sealed or treated for bathroom use. For counters, look for durable solid surfaces, and avoid anything requiring grout, which will be hard to keep clean in the long term. 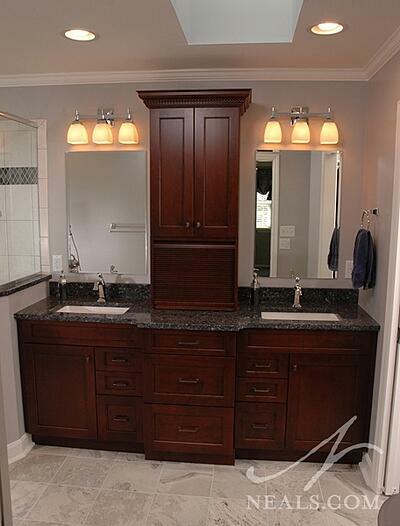 A traditional double vanity makes use of a vanity tower that separates the two sinks while adding storage. Before settling on a vanity style, assess your storage needs. 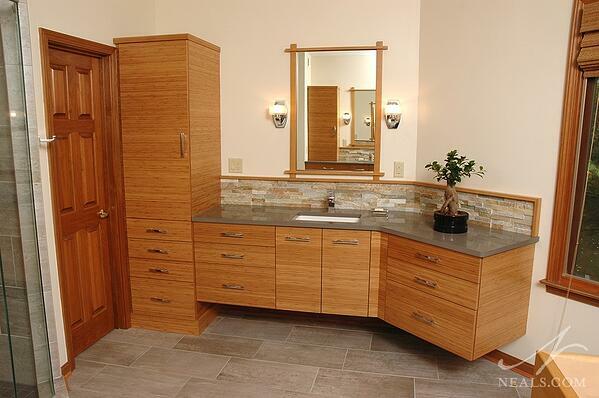 In many bathrooms, the vanity is the only location for storage, so it needs to be flexible and adequate. A double sink vanity is a great solution for a couple with different storage needs, and a vanity tower- a solution we use often- can increase shelving and even help define zones. In smaller bathrooms, a sink cabinet combined with a medicine cabinet can provide enough space for most basic bathroom needs. Along those same lines, think about how much open shelving and display you'd like to include in your vanity, and whether or not exposed plumbing appeals to you. Once you have an idea of how much space you require for storage, and what configurations make sense, it's easier to limit your style options to only those that are up to the task. A different take on the double vanity, two contemporary vanities come together in the corner of this master bath, giving both users ample space and storage. It would be impossible for us to outline all the style options available for bathroom vanities since there's a solution out there for every taste and budget. However, some components of a vanity that are mostly aesthetic, and can be based on your personal preference (with budget, maintance needs, and general feasibility in mind). These include the sink, faucet, cabinet color and door style, hardware, mirror or medicine cabinet, lighting, and decor. If tilework is a part of your bathroom plan, you should also look for the ways the vanity counter and mirror will work with that, if at all. If you're stuck with too many options, start an ideabook on Houzz or a board on Pinterest to collect ideas, and give yourself notes for what appeals to you. When you're ready to work with a designer to make your new vanity a reality, they can help you sort out these ideas and find the solution that works for you.